What’s the difference between Sculpsure & Coolsculpting? 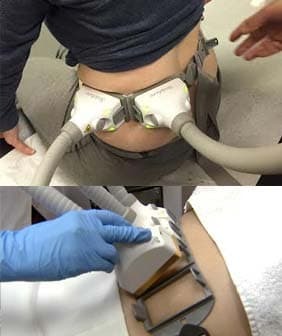 Both Sculpsure and CoolSculpting are effective non-surgical fat reduction procedures. The main difference is that while CoolSculpting gently freezes your fat, SculpSure uses heat to gently warm the fat cells until they reach the temperature where Lysis (they gently pop) occurs and are cleared away by your body’s lymphatic system. Basically, the pros of choosing SculpSure are that you have a built-in skin tightening effect with your treatment, which is great for the overall appearance post fat reduction treatment. By Choosing Coolsculpting you are able to treat some areas which SculpSure cannot yet treat, for example treating the submentum area or the double chin. Remember SculpSure is comfortable and 100% FDA Approved1 . Call (561) 323-4267 Today for more information.